Enter the keyword related to the term you wish to find. 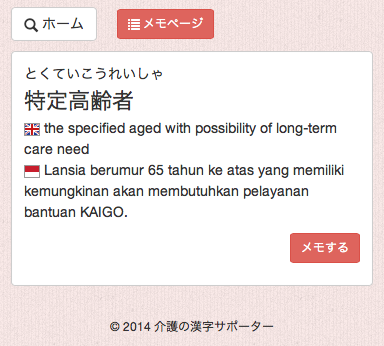 You can search in English and Indonesian in addition to searching by entering hiragana, katakana, and kanji terms. Your search result will display terms related to the keyword entered. You can view a list of terms included for each field and subject of the State Examination for Certified Care Workers. 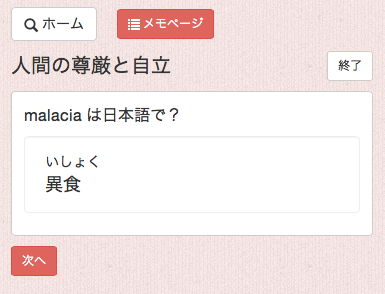 When you click a term, English and Indonesian translations will be displayed, along with related terms. 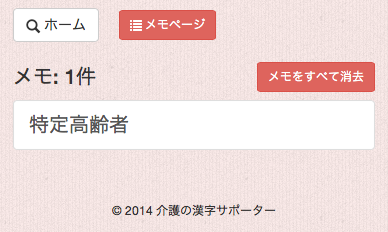 There is a "メモをする (Make a Memo)" button on the page for each term. When you press this button, the term will be recorded. 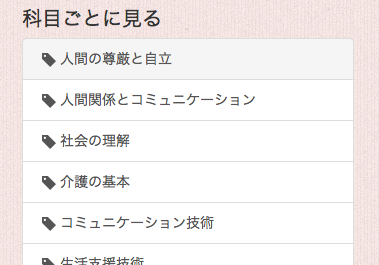 When you want to see the terms in your memo list, press the "メモページ (Memo Page)" button. You can easily go to the pages of each of the terms in your memo list from the Memo Page. This function enables you to quickly make a memo of the terms you wish to check at length later. You can take a simple quiz using the search results as well as the list of terms for each field and subject. 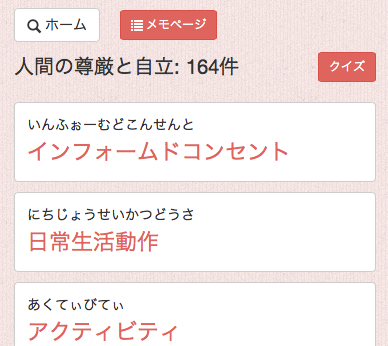 If you press "クイズ (Quiz)" on the top right of the screen, only the English translation will be displayed for each word. 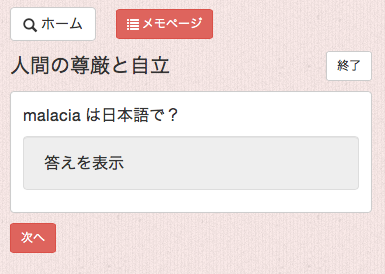 After you consider the appropriate corresponding Japanese term, you can press "答えを表示 (Display Answer)" to check if you were correct. Press "次へ (Next)" if you want to continue with the quiz or "終了 (End)" to finish.